Everybody knows to stabilise a scaffold we tie it to the adjacent building as the scaffold is erected. Depending on a number of factors such as geographic location, netting, sheeting height and load we determine in the design process what tie pattern to adopt and the frequency of ties. But is this all they do and how do they work? Ties however, are generally misunderstood, and undertake more than one function. Most people and scaffolders recognise they prevent the scaffold pulling away from the building but this is not their only function. In addition to this, they stabilise the scaffold from swaying parallel to the building and also allow the scaffold to be higher or carry more load depending on the frequency and pattern adopted. TG20:08 Cl 5.6 states ties should always be across both standards (unless otherwise designed) – one of the most common defects on inspected scaffolds. The reason for this is illustrated above. 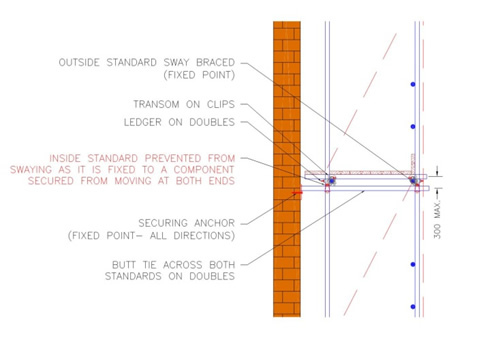 By installing the correct sway bracing, the outside line is prevented from moving parallel to the building. By securing the tie tube to the building façade and the outside line we now have a tube which is prevented from movement at both ends. When the inside line is now secured to this tube (with doubles) the inside line is now also prevented from moving parallel to the building. This is why inside lines are not sway braced! It is now clear why the absence of ties or fixing only to the inside line (a scaffolders favourite!) creates instability in the inside line. Under designed circumstances this can be overcome with the installation of inside line sway bracing, plan bracing or V-ties. Also within this section is an innocuous statement regarding sloping tie tubes – this one is less obvious! Due to the arc of rotation, when the scaffold pulls away from the building a downward sloping tube must move upwards to become horizontal – against gravity and the self-weight of the structure. When it is sloping upwards, its rotation is now downwards when the scaffold moves away. The tie tube moves downward and the scaffold outwards as the nodes tend to the horizontal – resulting in much less resistance offered by this mechanism.